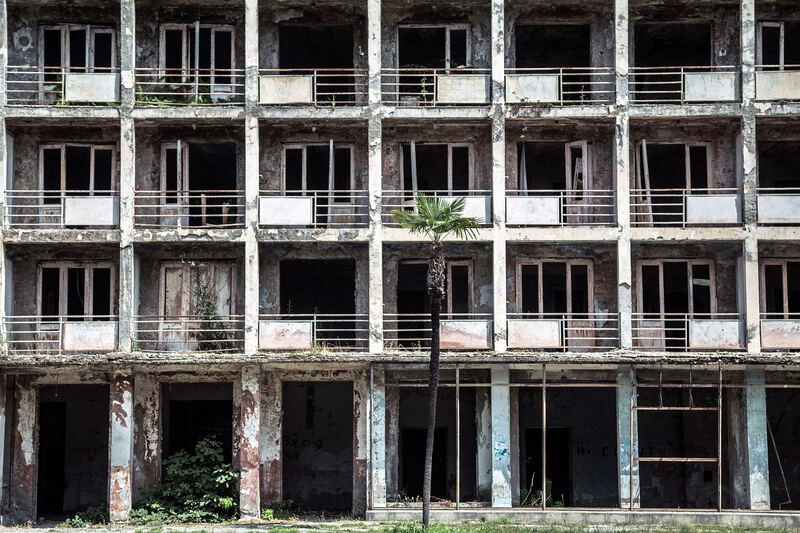 Above: Some old apartments in Sukhumi, Abkhazia Republic, destroyed by the last Abkhazian-Georgia war. June 2014. Photo by Giacomo Sini. Italian-native and Vice News photographer Giacomo Sini has traveled from Afghanistan to Lebanon to Syria to Iraq (and beyond) to capture both the beauty and the darkness in areas of conflict around the world. When did you begin photography? How did you get your start? A kurdish YPG fighter walking through a road on the south western’s Kobane frontline on April 2015. Photo by Giacomo Sini. What brought you to shooting in zones of conflict? Do you recall your first days witnessing / experiencing a conflict zone? One of the central roads of Kobane city (Rojava, Northern Syria), on April 2015. The city was freed from ISIS militiamen by YPG-YPJ on January 2015. Kobane has been completely destroyed by the conflict against ISIS and by the bombings of the anti-ISIS coalition between 2014 and 2015. Photo by Giacomo Sini. Which places have you traveled to? And what conflicts have you experienced? One of the central roads of Some young syrian refugees in Arsal, Lebanon, on the boundary mountains between Lebanon and Syria. Today this territory is occupied by ISIS militiamen. January 2014. Photo by Giacomo Sini. What are your most important supplies? What are some of the memorable people you met along the way? Some clothes from refugees are drying on the fence built by Republic of Macedonia’s authorities along all the border with Greece, in order to stop the entrance of the refugees in their territories. April 2016. Photo by Giacomo Sini. Do you recall any particularly humorous or unusual event? Did you keep a personal diary? How has your experience influenced your thinking about war? Some refugees from Kobane, having just returned to the city from Turkey after months of forced exile, sitting just a few meters inside the gateway of Rojava. April 2015. Photo by Giacomo Sini. How have your experiences affected your life? What are you capturing now?